Hong Kong is a city of surprises. Head out with these top activities tips today – in and out of the sun. Get creative. If your budding little Picasso is saying no to boring old paper and pens then take then book an art jamming session at Art Jam in TST for a shot at the real stuff. Choose the size and shape of your canvas and let loose with a full store cupboard of paints, brushes and other material – a masterpiece is inevitable! Work on your golf game: the Tuen Mun Golf Centre includes a 48,500 sqm driving range with 91 bays, various practice greens and bunker facilities. The centre offers courses for various levels, including public access areas, a restaurant, and a pro shop. Take a trip down the city’s memory lane by walking though Hong Kong’s old, abandoned oyster beds in Lau Fau Shan. Have a chat with the elderly oyster farmers who live in the area, then enjoy some fresh seafood on the shore. Take to the ice. Where better to cool off than at one of Hong Kong’s ice rinks? The ones at Megabox in Kowloon and Elements in Tsim Sha Tsui both boast international-sized ice rinks that offer plenty of room to unleash your inner figure skater. If your little one is in the mood to play pretend, visit the Dreams Come True Education Park located in Hong Kong airport. Kids can dress up in various costumes and uniforms and try their hands at being firefighters, astronauts or whatever their dreams may be. Get sporty: bring your bike to the Hong Kong Jockey Club’s BMX park in the Gold Coast. Kids can sign up for mini races or bike leisurely around the expansive track. Go butterfly viewing: The Fung Yuen Butterfly reserve in Tai Po is home to more than 200 different species of butterflies, including the rare White Dragontail and Birdwing Swallowtail. Learn about Hong Kong’s ecology on a guided tour or stop by the Fung Yuen Nature and Culture Education Centre to further your knowledge of Hong Kong’s various flora and fauna. Take the Ngong Ping 360 cable car from Tung Chung all the way up to Ngong Ping Village, have a delicious vegetarian lunch, and stand in awe of the Big Buddha! Is man’s best friend feeling lonely? Get together with dog-owning friends and head to Cyberport’s expansive dog park right on the water. Finish the day with a drink at Irish pub Delaney’s outdoor tables where pooches are permitted. Go swimming! The community pool at Sai Kung is a great way to keep cool; pack the towels, sunscreen and snacks and head to Wai Man Road to enjoy both the lap pool and the family-friendly kids’ pool, replete with water slides. Or, if you’re feeling adventurous, take the one-hour hike through the East Country Park to Sai Kung’s freshwater river pools. After a dip, make for the nearby beachside village of Sai Wan for a snack. Enjoy a French escape and get competitive at HK’s first indoor petanque rink at Les Boules Café Pétanque in Kennedy Town. Learn the rules of this favorite French past-time while enjoying a snack and a drink. Bring your A-game and a group of (competitive) friends. Explore Hong Kong’s natural wildlife; Tin Shui Wai is home to one of Asia’s best wetland parks. View a plethora of local animal life there, including birds, freshwater critters and Pui Pui the crocodile. Pack a picnic for family or friends and hop on the Disneyland MTR to Inspiration Lake. You can relax on the lawn, walk the promenade or rent a pedal boat on the lake itself. Engage in a variety of water sports at the St. Stephens Beach Water Sports Centre. Rent from their supply of sailing dinghies, windsurfing boards, kayaks and canoes for a twist to a simple beach day. Go for a dive. Although Hong Kong is not particularly known worldwide for its diving, it remains home to an abundance of aquatic wildlife. Book a dive with one of the various clubs, such as the South China Diving Club, or forge your own path and chose one of Hong Kong’s various diving locations. Good places to start include Ho Ha Wan Bay (known for starfish and jellyfish) or Little Palm Beach East (known for sea horses, cuttlefish, and pufferfish). Set sail. Sailing lessons are a great way to spend time in the water while learning new skills. Lessons are open to both members and non-members, and will leave you with a comprehensive beginners’ guide to sailing. Experience a renaissance: for an insight into a neighborhood in the midst of a cultural re-birth, take a trip to Chai Wan, Hong Kong’s East Side. This area, formerly known as Hong Kong’s industrial factories, now houses small stores, galleries, and cafés in its warehouse towers. Hire a junk or fishing boat at Sai Kung Ferry Pier and journey to Big or Little Millionaire’s Beach. Relax and enjoy the serenity of the lagoon-fed coast, then finish the night with a seaside barbecue or seafood on the pier. 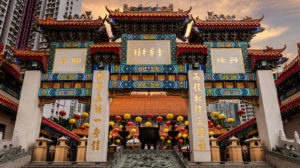 Head to one of Hong Kong’s most famous monastery, Ten Thousand Buddhas Monastery at Pai Tau Village, Shatin, for happy snaps with more than 13,000 buddha statues displayed throughout the temple halls, lining the stair walkways, and hillsides. There are no monks in this monastery, rather playful monkeys who have a keen eye for snacks hanging out of your pockets!